OneDrive app, Windows Phone 8後期的OneDrive已經可以支援多個Microsoft email 戶口的OneDrive, 不過Windows 8就可以將OneDrive map左做local drive! 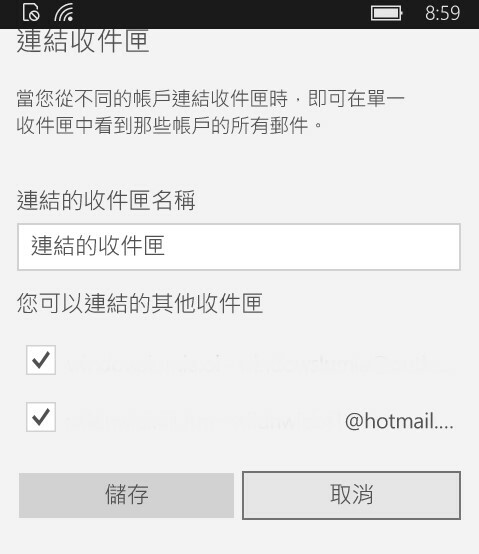 Email, Windows Phone 8(唔記得WP7是否都可以)可以linked埋幾個mailbox, W10 Mobile早期測試版係冇左這個功能, 不過最新Mail & Calendar更新後, 個功能已經加番上W10 Mobile個Mail app! 但係Windows 10, Mail & Calendar, 去到最新v1511 Build 10586.3, 個mail都係唔支援linked mailbox! GMT+8, 2019-4-25 17:48, Processed in 0.030187 second(s), 4 queries.